You would probably have heard of the phrase ‘ Epistle of Straw’ before? It is infamous, uttered by an exasperated Martin Luther all those years ago, a phrase that cannot be erased from the history of the Protestant Church, to dismiss and describe the teachings in the Epistle of James, that salvation is by deeds, as compared to the other teachings in the rest of the Bible, that salvation is by faith and through grace. Today we dismiss Luther’s words a bit too quickly, without considering the context that he was in – struggling hard to reform Christianity, he was frustrated by the many false teachers who came out and said, do this and this and that and you will be saved. Or the many who thought they could buy their way into salvation. It is a regrettable phrase that he certainly did say, for James is an amazing epistle, but if he had not said that, the later generations would probably not have scoured over the text so much in order to debunk his words and to understand James’ context. One of the offending passages that led to Luther’s words can likely be found in James 2. In today’s study, we will examine the definition of faith as taught by James and think about justification. if someone claims to have faith but has no deeds – This faith has already been labelled and separated. It is a different faith – one that was made by claim, and has no deeds to support it. Was it common in those days? I would certainly think so – a man who goes around telling people of how much he believes in the Lord, all the while exploiting his friends, gossiping about his family, dishonest in his business, and demeaning to the poor. It is common, no matter the era, no matter the time, no matter the country. A person who would call himself a man of faith, but nobody else would call him one. can such faith save them – there it is, the doctrine of justification, a constant struggle to our understanding of our salvation, and where many fall in their attempt to understanding. 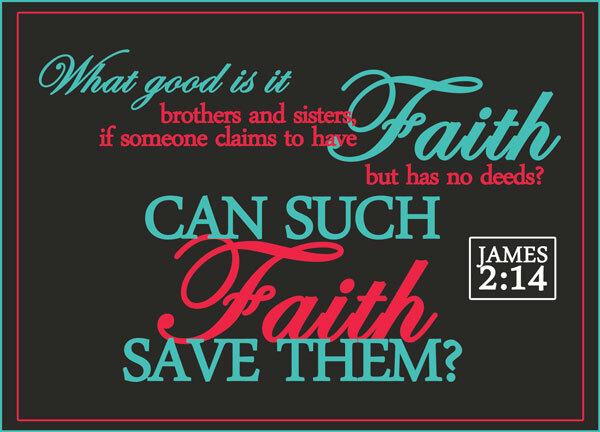 Can such faith – note ‘such’ faith – this refers to this common brand of faith that we’ve discussed earlier. It is a rhetorical question – we know, whether we agree or not, that James really means that this faith cannot save them. They are not justified, and they will not be saved. It is really just quite simple. What is faith? Hebrews 11, hall of faith, tells us – Now faith is confidence in what we hope for and assurance about what we do not see [Heb 11:1|Article]. Confidence in what we hope for, assurance about what we do not see. Romans 10:9 – tells us to confess with your mouth and believe with your heart [Rom 10:9|Article]. If we truly are confident and assured in things intangible and cannot be seen – the hope that which is eternal, and we truly believe with our hearts and are able to confess it with our mouths, then we have faith. And that faith in the gospel will give us hope for the eternal, which in turn gives us a heart of love towards God, who first loved us [1 John 4:19]. And if we love him, we obey his commands [1 John 5:3]. And what are his commands? Look after orphans and widows [James 1:27]. Love your enemies [Matthew 5:44]. Give [Luke 6:38]. Walk in the Spirit [Gal 5:16]. Obey Authorities [Heb 13:17]. Oh, but the list goes on. There are hundreds of these. They are deeds. They are tangible actions. They can be seen. Let’s permutate. If you have deeds, but do not believe in the Lord, then there is no salvation. If you have deeds, but do not truly believe in the Lord, then there is no salvation. If you believe in the Lord, but have no deeds – then you do not truly believe, your faith is false, and there is no salvation. Ultimately, it is still about the faith – we are justified by faith apart from the works of the law [Rom 3:28]. If anything, our works and deeds do not justify our salvation – if anything, they are an evidence of our faith, and our faith justifies us. If you read the entire passage in James 2, you will notice that James minced not his words. Even the demons believe that and shudder [James 2:19] – even the demons have more faith than you, if this is what you define faith as! Harsh, really harsh, especially to the scores of people who were like that in those days. It is not really about personality or their flaws – it is really just a gross misunderstanding of the word of God. But that is to be expected – in those days, the Bible was not yet completed, and even if the apostles went around preaching and Churches were formed all over, there were still plenty of false preachers around, and many misconstrued concepts. The Pauline epistles and Peter’s epistles, which touch a lot upon this topic as well, were likely not written yet too. Hence, imagine James – a strong leader in Jerusalem, a pillar of the Church [Gal 2:9]? If it was indeed the first epistle to be written, there was greater need to be harsh. What more, for whatever reasons, the epistle of James only have 5 chapters – a total of 108 verses. He did not have the scores and scores of pages that Paul had – the epistle after epistle – in order to explain the doctrine clearly. But was it sufficient? Certainly – if his teachings were incomplete, or flawed in any way, I don’t think it would have lasted over two thousand years of Church history. Surely God’s hands must have been over it as well. Deeds. Actions. Faith without actions is dead [James 2:26]. These actions are not to justify our salvation, but really, a natural and external expression and manifestation of our faith. Let us not be weary in doing good [Gal 6:9|Article]. Let us not just talk, but walk the talk.